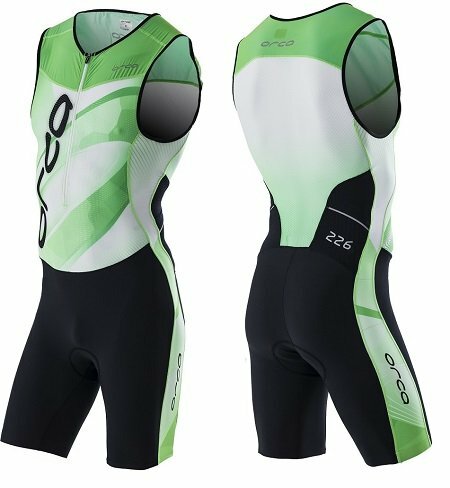 NouvelleTrifonction Orca 226 (gamme longue distance) tres performante destinée a toutes les distances du triathlon.Ce produit est confortable,leger et tres respirant.La chamoisine en 3 D est parfaite pour les tres longues distances.Le zip avant et les materiaux en mesh aeré sont parfaits pour les fortes chaleurs.Ce produit possede des renforts sur la partie cuissard qui procurent un gainage musculaire et une compression legere retardant ainsi les effets de la fatigue.Vous pourrez emporter facilement vos barres et gels energetiques grace aux deux poches arrieres a rabat. Having first introduced the triathlon world to the concept of long distance-specific apparel, Orca has set a new benchmark for high performance with the all new 226 Kompress Race Suit. Orca combines three new innovative fabrics with features and construction perfectly suited to endurance triathlon racing. 70 denier, circular knit KillaSkn Kompress is used in the lower part of the race suit to provide active and graduated compression to the legs. A unique double thickness panel of compression fabric has been placed in the lower back area for increased levels of support. Orca’s new Vapour-Cool fabric uses nano crystals embedded in the fibre to naturally conduct heat away from the body, keeping you cool. The cross-section yarn construction enhances moisture wicking and dries quickly. This highly breathable fabric also contains silver ions that are antibacterial and deodorizing, and anti-allergy, making it ideal for longer distance racing and use in hot conditions. The new wide cut KompressMesh leg hems use a compression mesh bonded seal. This provides a super comfortable, low profile hem that aids with muscle compression and aids blood flow from the upper legs to the heart. Wide gauge Tri-Enduro Mesh is used on the back panels for breathability and moisture management.The UPF50+ protection offered by all fabrics used in this suit makes it ideal for race days when you're out in the elements for long periods of time. The latest generation 4mm Tri-tech Chamois has perforations to increase its quick dry qualities, and is anti-bacterial, making it more comfortable on the bike and run. There are two covered rear pockets with reflective trims for secure storage and visibility in low light conditions, and a new internal chest pocket. Orca’s 226 badge has become synonymous with the highest levels of performance, comfort and durability in endurance distance racing.